I told my friend in CA about your journey because her Mom and Sisters live in Glendive, wait till she sees their town made it on the web! Did you tell them to watch out for Matt and invite him in for a bite? Maybe a place to sleep? Would be nice if they did. Imagine the stories they could tell back to you! That would be awesome. Go chase him Chaser1….tell him we all say hi! hello. Sounds like you might be a regular at Beer Jug. You drink a cold frothy mug of beer and chase it with a shot of Tequila. I’m I right? Hope you were able to meet Matt Hobo Green. Alternate caption: Please don’t shoot the bartender. Is this a bar and sporting goods store? Im impressed….you’re movin right along…. How about some party ettiquette here. to serve wine in a shot glass. to get whiskey in a mug. and JUGS should hold moonshine. Very good Dennis! I like the rhyme. 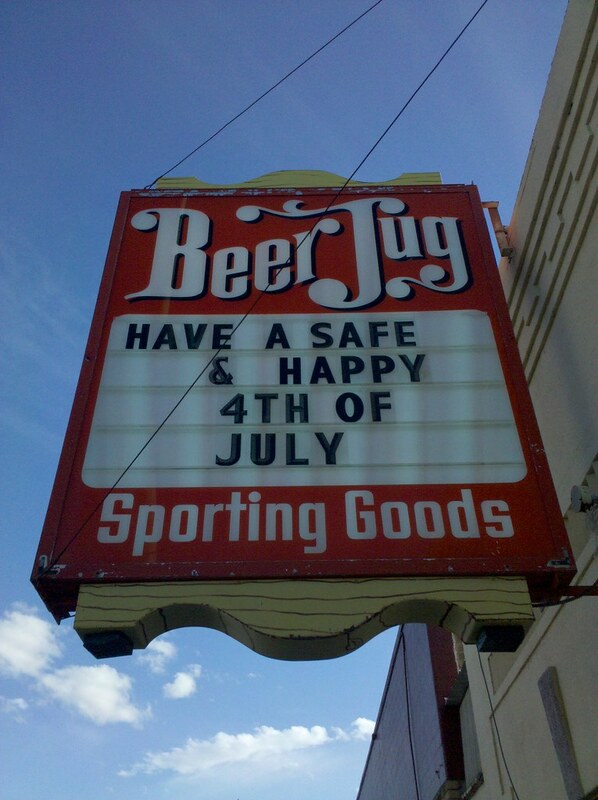 I guess beer drinking is considered a sport in Montana. There must be penalties for spillage! And don’t forget their sandwiches. They are the best!